Random Handprints - A NYC Mom Blog... live from New Jersey: Poison Ivy Advice, Identification And Rhymes, Too! Poison Ivy Advice, Identification And Rhymes, Too! It wouldn't be summer if I wasn't worrying that every plant, vine and leaf that I see is in fact not an innocent piece of flora, but in fact, the dreaded Poison Ivy. Not only are the photos incredibly helpful to know what to avoid, but I love the rhymes like "Hairy vine, no friend of mine." I didn't even know that poison ivy can appear as a hairy vine! 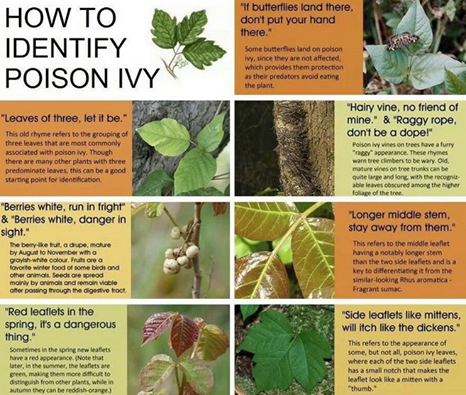 So this summer, I will be consulting this Poison Ivy Identification graphic often, while hoping for the best. I was not compensated for this post and I'm sorry not to have cited the photo properly, I can't remember where/how/or from whom I got it. July 4th Craft with Kids: Make an American Flag!